Leaving Aswan (Assouan), indeed as soon as we have passed the last house, we come at once upon the desert. And now the night is falling, a cold February night under a strange, copper-colored sky. A desert which preserves still its aspects of reality. The granites alone litter the expanse of sand, granites to which the centuries have given the form of huge round beasts. In places they have been thrown one upon the other and make great heaps. Elsewhere they lie alone among the sands, as if lost in the midst of the infinitude of some dead sea shore. The rails and the telegraph poles have disappeared. By the magic of twilight everything has become grand again, beneath one of those evening skies of Egypt which, in winter, resemble cold cupolas of metal. And now it is that you feel yourself verily on the threshold of the profound desolations of Arabia, from which no barrier separates you. In fact it has no limits. After traveling for about three-quarters of an hour, we see in the distance a number of lights, which have already been kindled in the growing darkness. They seem too bright to be those of an Arab encampment. Our driver, turning round and pointing to them says: "Chelal!" Chelal--that is the name of the Arab village near to Philae (Philæ, Egyptian: P'aaleq). To my disgust the place is lighted by electricity. The town consists of a station, a factory with a long smoking chimney, and a dozen or so suspicious-looking taverns. Here we embark for Philae. A number of boats are ready, for the tourists allured by many advertisements flock hither every winter in docile herds. All the boats, without a single exception, are profusely decorated with little English flags, as if for some regatta on the Thames. There is no escape from this beflagging of a foreign holiday. The copper colored heaven remains so impregnated with cold light that we still see clearly. We are amid magnificent tragic scenery on a lake surrounded by a kind of fearful amphitheatre outlined on all sides by the mountains of the desert. 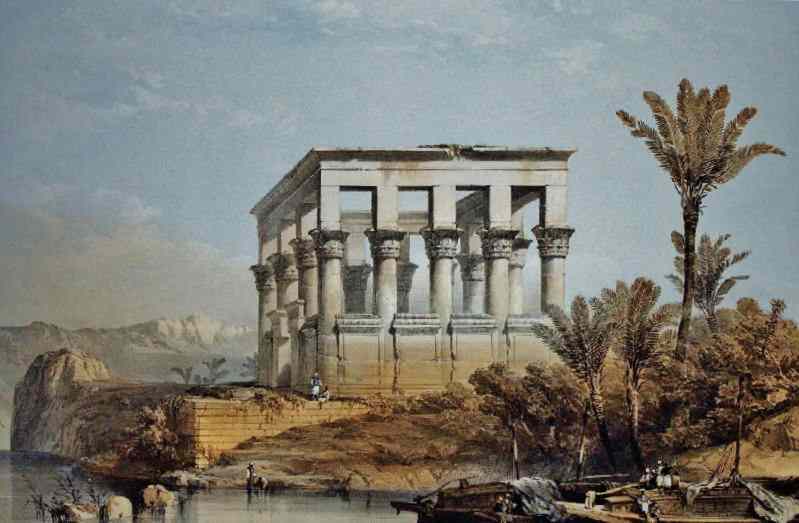 It was at the bottom of this granite circus that the Nile used to flow, forming fresh islets, on which the eternal verdure of the palm trees contrasted with the high desolate mountains that surrounded it like a wall. 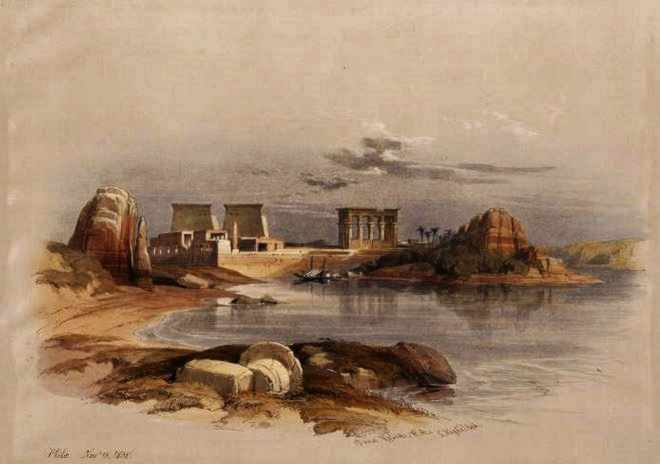 Today, on account of the Aswan Dam established by the English, the water has steadily risen, like a tide that will never recede, This lake, almost a little sea, replaces the meanderings of the river and has succeeded in submerging the sacred islets. The sanctuary of Isis (Aset) still half emerges, but it is alone and will soon go the way of the others. It is famed Philae, enthroned for thousands of years, crowded with temples and colonnades and statues. There it is, beyond, like a great rock, at this hour in which the night begins to obscure everything. Nowhere but in Upper Egypt have the winter nights these transparencies of absolute emptiness nor these sinister colorings. As the light gradually fails, the sky passes from copper to bronze, but remains always metallic. The zenith becomes brownish like a brazen shield, while the setting sun alone retains its yellow color, growing slowly paler till it is almost white. The mountains of the desert edge their sharp outlines with a tint of burnt sienna. Tonight a freezing wind blows fiercely in our faces. To the continual chant of the rowers we pass slowly over the artificial lake, which is upheld as it were in the air by the English masonry, invisible now in the distance. A sacrilegious lake one might call it, since it hides beneath its troubled waters ruins beyond all price: temples of the gods of Egypt, churches of the first centuries of Christianity, obelisks, inscriptions and tombs. It is over these things that we now pass, while the spray splashes in our faces, and the foam billows. We draw near to what was once the holy isle. In places dying palm trees, whose long trunks are today under water, still show their moistened plumes. They give an appearance of inundation, of cataclysm. 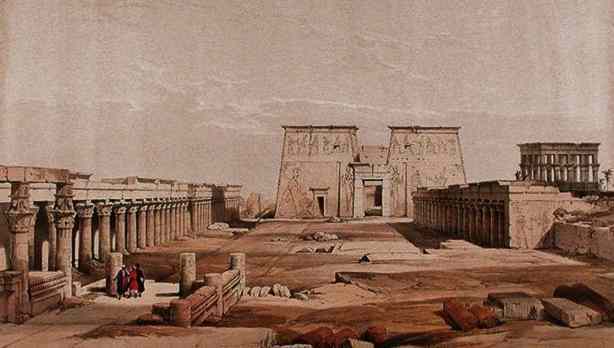 sometimes called the Hypaethral Temple or the "Bed of Pharaoh"
Before coming to the sanctuary, we touch at the kiosk of Philae, which has been reproduced in the pictures of every age, and is as celebrated even as the Sphinx and the pyramids. It used to stand on a pedestal of high rocks, and around it the date trees swayed their bouquets. Today it has no longer a base. Its columns rise separately from this kind of suspended lake. It looks as if it had been constructed in the water for the purposes of some kingdom of the sea. We enter with our boat--a strange port indeed, in its ancient grandeur. A port of a nameless melancholy, particularly at this yellow hour of the closing twilight, and under these icy winds that come to us mercilessly from the neighboring desert. And yet how adorable it is, this kiosk of Philae, in this the abandonment that precedes its downfall! Its columns placed, as it were, upon the water, become thereby more slender, seem to raise higher still the stone foliage of their capitals. A veritable kiosk of dreamland now, which one feels is about to disappear for ever under these waters. And now, for another few moments, it grows quite light again, and tints of a warmer copper reappear in the sky. Often in Egypt when the sun has set and you think the light is gone, this furtive recoloration of the air comes thus to surprise you before the darkness finally descends. The reddish tints seem to return to the slender shafts that surround us, and beyond, to the temple of the goddess, standing there like a sheer rock in the middle of this little sea. On leaving the kiosk our boat makes a detour in order to lead us to the temple by the road which the pilgrims of olden times used to travel on foot. A little while ago this road was still magnificent, bordered with colonnades and statues. Now the road is entirely submerged, and will never be seen again. Between its double row of columns the water places us to the height of the capitals, which alone emerge. We could touch them with our hands. It seems like some journey of the end of time, in a kind of deserted Venice, which is about to topple over, to sink and be forgotten. We arrive at the temple. Above our heads rise the enormous pylons, ornamented with figures in bas-relief. 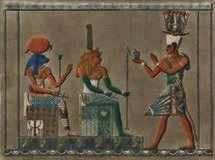 Isis stretches out her arms as if she were making signs to us, and numerous other divinities gesticulate mysteriously. The door which opens in the thickness of these walls is low, besides being half flooded, and gives on to depths already in darkness. We row on and enter the sanctuary. The darkness increases within, although the place is open to the sky, and the icy wind blows more mournfully than it did outside. A penetrating humidity--a humidity altogether unknown in this country before the inundation--chills us to the bone. We are now in that part of the temple which was left uncovered, the part where the faithful used to kneel. The sonority of the stone walls round about exaggerates the noise of the oars on the enclosed water, and there is something confusing in the thought that we are rowing and floating between the walls where formerly, and for centuries, men were used to pray with their foreheads on the stones. And now it is quite dark; the hour grows late. 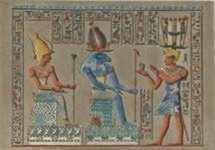 We have to bring the boat close to the walls to distinguish the hieroglyphs and rigid gods which are engraved there. These walls, washed for nearly four years by the inundation, have already taken on at the base that sad blackish color which may be seen on old Venetian palaces. Halt and silence. It is dark and cold. The oars no longer move, the boatman's song has ceased and we hear only the sighing of the wind and the lapping of the water against the columns and the bas-reliefs. Suddenly there comes the noise of a heavy body falling, followed by endless eddies. A great carved stone has plunged, at its due hour, to rejoin in the black chaos below its fellows that have already disappeared. 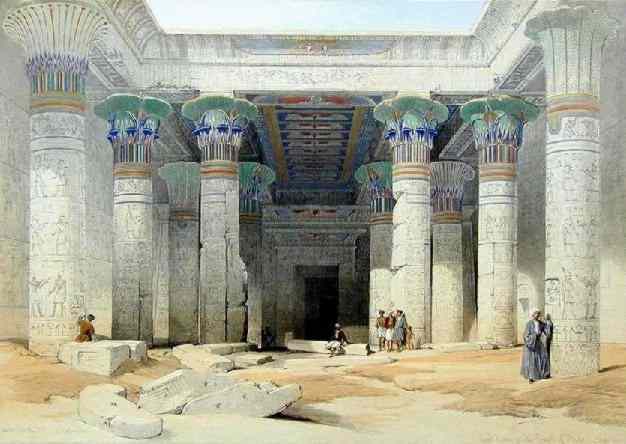 It rejoins the submerged temples and old Coptic churches, all that was once the Isle of Philae, the "pearl of Egypt". At the end of this uncovered hall there opens a door which gives on to deep night. It is the holy of holies, heavily roofed with granite, the highest part of the temple, the only part which the waters have not yet reached. There we are able to put foot to earth. Our footsteps resound noisily on the large resonant flagstones, and the owls take to flight. Profound darkness - the wind and the dampness freeze us. The darkness is now extreme and we can see no longer. Let us go and shelter, no matter where, to await the Moon. To wait in this place would be more than could be borne. Rather let us return to Chelal, and shelter ourselves in any lodging that offers. A tavern of the dreary village in the light of an electric lamp. It reeks of absinthe, this desert tavern, in which we warm ourselves at a little smoking fire. It has been hastily built of the debris of whisky cases. Nubians and Arabians follow one another hither, asking for drink. They are the workers in the new factories who were formerly healthy beings, living in the open air. But now their faces are stained with coal dust, and their haggard eyes look unhappy and ill.
from "la Description de l'Egypte", 1802. The rising of the Moon is fortunately at hand. Once more in our boat we make our way slowly towards the sad rock which today is Philae. The wind has fallen with the night, as happens almost invariably, and the lake is calm. The sky now is blue-black, infinitely distant, where the stars of Egypt scintillate in myriads. A great glimmering light shows now in the east and at length the full Moon rises, straightway very luminous, and surrounded by an aureole of a kind of mist, caused by the eternal dust of the sands. 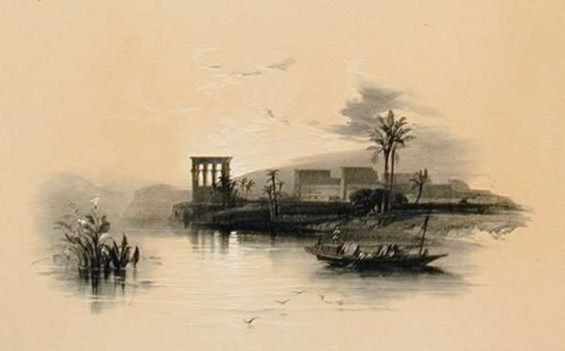 And when we return to the baseless kiosk--lulled always by the Nubian song of the boatmen, the great disc is already illuminating everything with a gentle splendour. As our little boat winds in, we see the great ruddy disc passing and repassing between the high columns, so striking in their archaism. Those images are repeated in the water, that has now grown calm--more than ever a kiosk of dreamland, a kiosk of old-world magic. In the uncovered hall which forms the entrance to the temple, it is still dark between the sovereign stones. Let us moor our boat against one of the walls and await the pleasure of the Moon. As soon as she shall have risen high enough to cast her light here, we shall see clearly. It begins by a rosy glimmer on the summit of the pylons. Then appears a luminous triangle, very clearly defined, which grows gradually larger on the immense wall above us. Little by little it descends towards the base of the temple, revealing to us by degrees the intimidating presence of the bas-reliefs, the gods, goddesses and hieroglyphs, the assemblies who make signs among themselves. We are no longer alone--a whole world of phantoms has been evoked around us by the Moon, some little, some very large. They had been hiding there in the shadow and now suddenly they recommence their mute conversations, using only their expressive hands and raised fingers. And now also the colossal Isis begins to appear--the one carved on the left of the portico by which you enter. First, her refined head with its bird's helmet, surmounted by a solar disc; then, as the light continues to descend, her neck and shoulders, and her arm, raised to make who knows what mysterious sign. and finally the slim torso, and her hips close bound in a sheath. Behold her now, the goddess, come completely out of the shadow. . . . But she seems surprised and disturbed at seeing at her feet, instead of the stones she had known for two thousand years, a reflection of herself that stretches away, reversed in the mirror of the water. . . . Suddenly, in the mist of the deep nocturnal calm of this temple comes again the sound of of mournful booming, of things toppling, precious stones becoming detached and falling. On the surface of the lake, a thousand concentric circles form, close one another and disappear, ruffling indefinitely this mirror embanked between the terrible stones, in which Isis regards herself sorrowfully. Philae Temple about the time of the Author's visit. Author's Postscript: -- The submerging of Philae, as we know, has increased by no less than seventy-five millions of pounds the annual yield of the surrounding land. Encouraged by this success, the English propose next year to raise the barrage of the Nile another twenty feet. 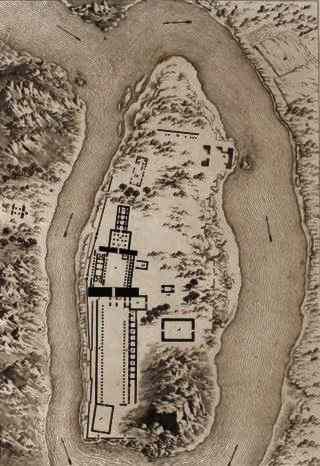 As a consequence this sanctuary will be completely submerged, the greater part of the ancient temples of Nubia will be under water, and fever will infect the country. But, on the other hand, the cultivation of cotton will be enormously facilitated. 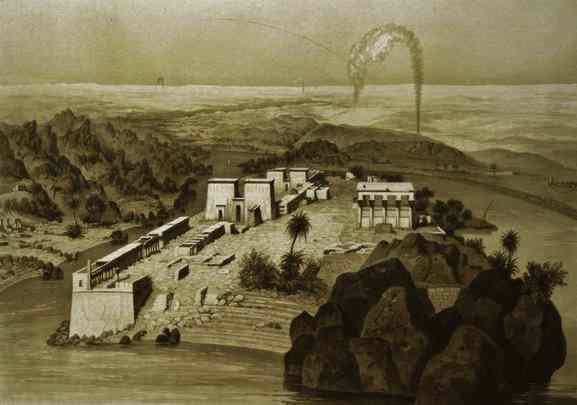 The first dam at Aswan was constructed in 1898--1902. The author of the above account, Pierre Loti, therefore visited the island about 1905. The first dam was built higher in 1907-12 and again in 1929-34. 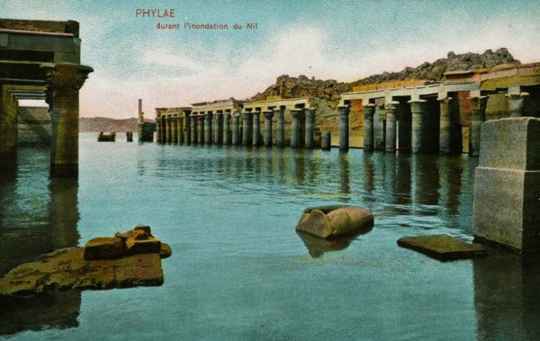 The second, still higher Aswan dam was built upstream of Philae. 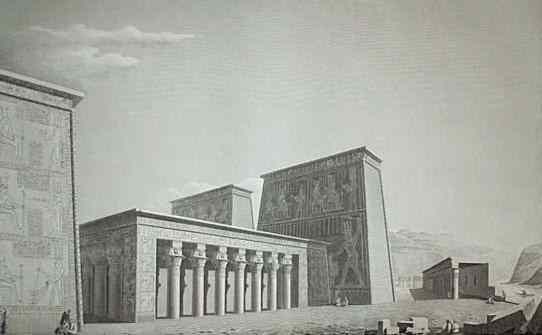 The United Nations moved the temple of Philae in 1972 - 1980 to another island nearby, Agilkia, and most of the damage was hidden. The Priestesses of Isis likely were not consulted.